From the kitchen of One Perfect Bite...I've been looking for a new dessert to serve on Valentine's Day. 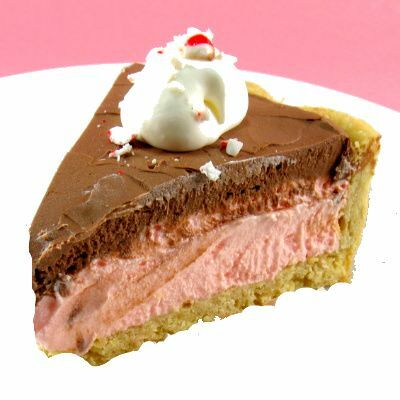 While searching for recipes for National Pie Day, which coincidentally is today, I found this lovely Chocolate Peppermint Pie on the Wisconsin Milk Marketing Board web site. It would be perfect for Valentine's Day and I knew I had to try it. Any recipe that combines white and dark chocolate with peppermint and cream cheese gets my attention immediately. I must tell you I wasn't disappointed, but there are things I'd change the next time I make the pie. Forget the crust. It doesn't add much to the pie. Use a prepared chocolate crumb shell instead. It will add another layer of flavor and save a lot of time as well. I'd also make the pie 24 hours before I plan to serve it. If you look at my photo, you'll see that the layers "bled" together when the pie was sliced. I think that can be avoided with longer chilling. You might also want to add a touch of red food coloring as the crushed peppermint adds only a hint of color to the white chocolate layer. It's sinfully rich and very sweet, but it's a dessert meant for a special day, so, I gave myself absolution and will atone with an extra hour on the treadmill. I do hope you'll try it. The verdict of my tasters was "most excellent". Here's the recipe. 1) In a bowl, stir together flour, sugar and salt. Using a pastry blender, cut butter cubes into flour mixture until pieces are pea-size. Sprinkle vinegar over flour mixture, tossing with a fork. Sprinkle 5 to 6 tablespoons cold water, 1 tablespoon at a time, over flour mixture, tossing with a fork each time until dough is moistened and crumbly. Gather dough into a ball, flatten into a disk, wrap in plastic wrap and refrigerate at least 4 hours. 2) Preheat oven to 400ºF. 3) Roll dough into a 12-inch circle. Gently fold the crust into quarters, center over 9-inch pie plate and unfold. Ease crust into the plate. Trim pastry, leaving a 1-inch overhang beyond plate edge. Fold crust edge under and crimp or flute the edge using a fork or your fingers. 4) Prick pastry with a fork. Line bottom and up sides of crust with foil and add dried beans or pie weights. Bake for 15 minutes, remove foil. Bake an additional 10 to 15 minutes, until crust is golden. Remove to a wire rack; cool completely. 5) In a bowl, beat butter, cream cheese and sugar together. Combine egg product and whipping cream in a separate bowl; gradually add to butter mixture while beating, scraping bowl often. Beat until light and fluffy, about 5 minutes. Reserve half of mixture in a small bowl. Add cooled white chocolate to remaining half of mixture; beat well. Stir in crushed candy. Spread in baked pie crust; chill 10 minutes. 6) Return reserved butter mixture to bowl, add cooled semi-sweet chocolate; beat well. Spread over white chocolate layer. Refrigerate at least 2 hours. Garnish and serve. Yield 8 servings. *Note: Pasteurized egg products are available in the supermarket. The reason the recipe calls for this product is that the filling is not cooked, and there is a salmonella risk associated with eating raw eggs. Those colors are so nice. Yummy pie! Pretty pie! Happy Pink Saturday! My pink cake = crumbly. That is the prettiest pink pie Ive seen! when I saw the picture I just had to click. perfect for valentine. Blonde Duck mentioned it was National Pie Dad today...I had no idea. What fun. I MUST make a pie today and why not yours? Yummy- chocolate and peppermint. Such a pretty in pink photo! I have plans of making a minced meat pie today...didn't realize it was Nat'l Pie Day....cool. This looks luscious...pink and all. Yummy. Thank you so much for this one! My Dad has been going through a tough period (medical issues) and this will be the perfect pick me up for an elderly gentleman who loves chocolate and peppermint! You know Mary, I'll have to check out your blog much later in the day (6:30 AM here), because I always feel like I can jump into the screen for a bite.. I'm so glad I read this bright and early this morning, I would hate to go through the day and not know that I was supposed to be eating pie! Looks lovely -- and yes, there is nothing like chocolate and peppermint. I may follow your example and make this for my Valentine's lunch! Perfect colors indeed for Valentines Day!! Wonderful flavors too. I always appreciate your honest suggestions! National Pie Day! Well, I think we all need to celebrate. And, this looks absolutely divine. I was hoping I would hear from you in reference to the e-mail I sent about the picture. Happy Pink Saturday, Mary. Thank you for always making Pink Saturday special. This is a perfect Valentine's Day recipe. I love chocolate and peppermint together. I'll be making that for sure and without a doubt. I usually blend a little cinnamon with chocolate but this peppermint treat is now on the menu! Oh my oh my, another favourite recipe! Love it. Thanks for sharing and have a tremendous weekend. Cheers! Oh Mary - this pie looks SO delightful! That looks and sounds DELICIOUS! I have got to try it! Two of my favorite things in the world, Mary... chocolate and peppermint. Does it get any better than this??? I don't think so! I think you've got it!! This sounds absolutely delicious..all the flavors would be fantastic. Mary, this is perfect for Pink Saturday. And so delicious looking!! If you are offering a slice of this pie - I would love to be your valentine! I have a soft spot for all things cream cheese and this looks like the perfect Feb 14th treat. That looks better than any Baker Square pie I've ever had. A dark and white chocolate blend sounds amazing and very suitable for Valentine's day. OMG!!! !SO SO SO SO SO YUMMY! Love the layers and the colours are gorgeous! Oh boy, I love chocolate and I love mint! Ummmmm! Happy Pink Saturday, Mary! It is national pie day! Happy Day. And your pie looks perfect. I think this would be great with a chocolate pie crust, too. Such pretty colors! Happy Pink Saturday !!! I have enjoyed visiting your blog and viewing your lovely food photos - the pie looks delightful. Please a wonderful new week. I've charmed you!? Your blog is amazing! Thanks so much for stopping over at mine. How in the world did I not know it was National Pie Day? I've been hankering to make a blueberry pie the last few days. I will surely try this pie, it looks delish. I really want to try that. Mary, save me a piece of that pie please. It looks might tasty. Oh I don't mind the calories at all! Nope :-) And would also eat them not just on Valentines Day LOL But I guess this pie just have to be very special. Hi Mary, I didn't know how to contact you so I left a comment here. I like to invite you to http://www.tasteandshare.com, a food & wine social network, where you can share photos, videos and a link to your own blog. Oh! I missed national Pie Day!!! I'd happily take yours off your hands.... scrumptious. The peppermint lovers in my family would be made for this! Great find and great share. Appreciate your thoughts for next time. Thank you soooo much.